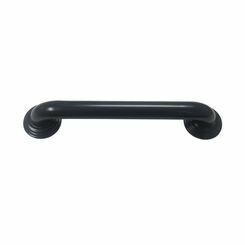 Safety grab bars are installed in both commercial and residential bathrooms in order to help users more comfortably maneuver off the toilet or out of the bathtub/shower. 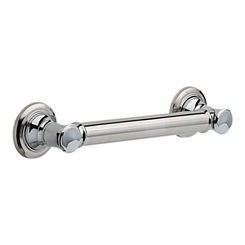 PlumbersStock has several options so that you can find an option that matches your design. 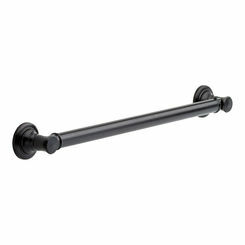 Bathroom grab bars are mandated by the ADA (Americans with Disabilities Act) in public restrooms, but if you have elderly or disabled users we highly recommend installing them in your home. 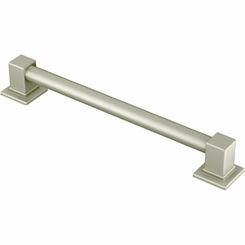 Browse through our inventory and purchase discount safety bars and other bathroom accessories. Vertical bathroom grab bars help the users with balance while standing. 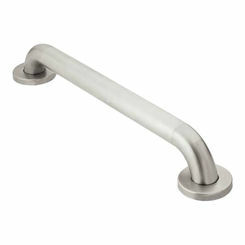 Horizontal safety bars offer help when sitting or rising from the toilet, horizontal ones can also be used to grab onto in case of a slip or fall. 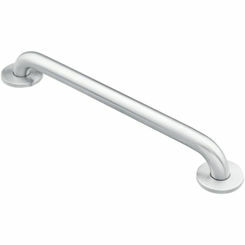 Grab bars can also be installed at an angle, although this installation type is not ADA compliant. 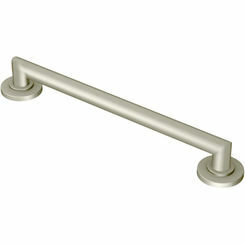 Residential units are installed at an angle because it is often easier for the user to pull themselves up from the seated position when using an angled unit. Grab bars come in a variety of lengths in order to accommodate and fit a variety of wall spaces. 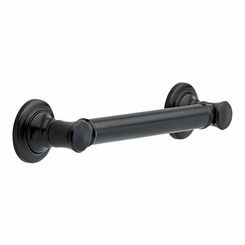 No matter what length of is installed, the installation should ensure that the bathroom grab bar will not pull of out the wall when pressure is applied. 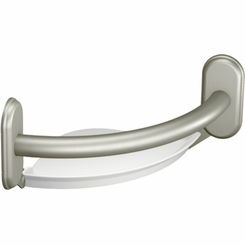 The best support can be found when the grab bar is properly secured into wall studs. If no studs are available for the desired location, specialized hanging products can be purchased and installed for better support. 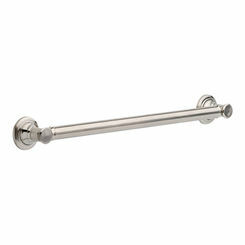 Along with elongated toilet bowls, grab bars are now becoming a common fixture in the bathrooms for users who are elderly or disabled. Bathroom safety bars help to accommodate those persons who need help standing up off the toilet or safely exiting the shower. 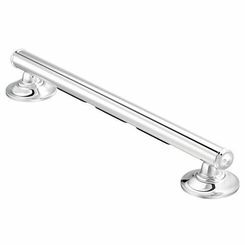 Manufacturer’s such as American Standard, Delta, and Moen have recognized that more customers are purchasing bathroom grab bars for use within their homes and therefore the finishes and overall appearances of grab bars has changed dramatically within the last few years. 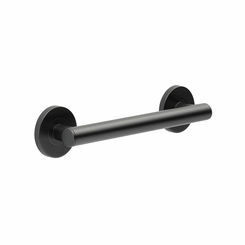 Consumers can now purchase them in oil rubbed bronze in order to compliment their existing tub and shower trim or sink faucet. 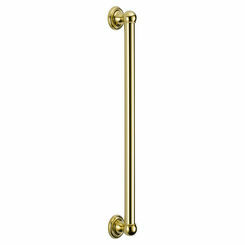 The diameter should be 1¼ to 1½ inch. 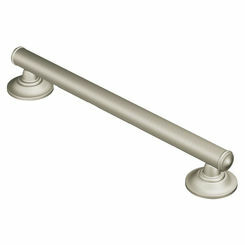 There must be a 1½ inch clearance from the wall (manufacturer implemented). 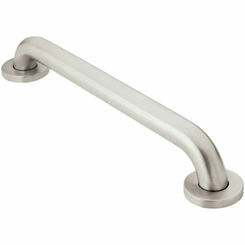 The safety bar cannot rotate in its fittings. 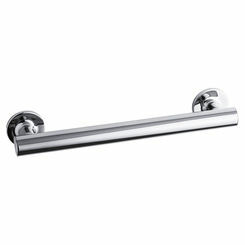 The universal mounting height that is required ranges from 33 to 36 inches from the centerline of the grab bar to the finish floor. ADA compliance requires that they be able to withstand more than 250 pounds of force. 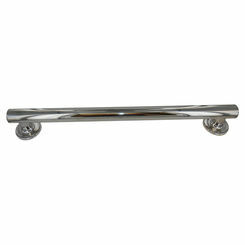 Side bars must be a minimum of 42 inches long and mounted 12 inches from the rear wall. 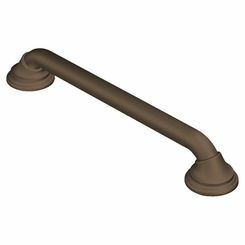 Rear grab bars must be a minimum of 36 inches long and mounted a maximum of 6 inches from the side wall.